Over the summer, I helped a friend clean out a storage unit. Everything had to go, except for the few small items that caught my eye for future use. 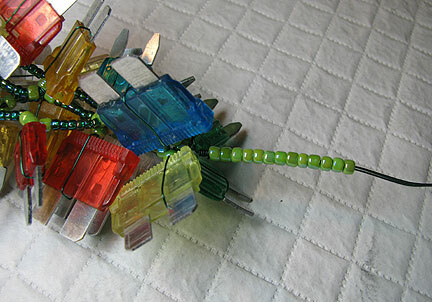 Two boxes of different colored fuses? Why not...I'll think of something to do with them! 1. Cut off a 5 to 6 foot piece of colored craft wire. In the center of the wire, wrap the first fuse and twist the wire tightly to secure. 2. 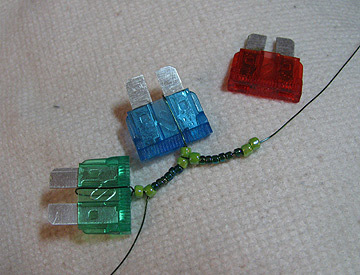 Add an 8/0 seed bead over both wires. Bend one wire out of the way and work from the center outward with one wire at a time. On the first wire, add another 8/0 seed bead, 6 11/0 seed beads, and 2 more 8/0 seed beads. 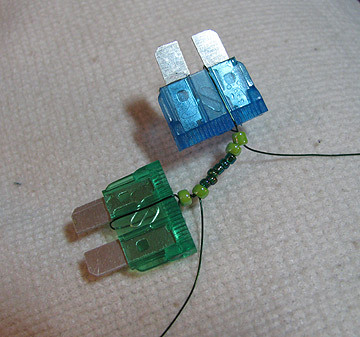 Wrap the wire around the next fuse, take the wire down through the top 8/0 seed bead, and wrap the wire around 3 or 4 times to anchor the fuse. 3. Add an 8/0 seed bead, 6 11/0 seed beads, and 2 more 8/0 seed beads. Repeat from step 2 until near the end of the wire, leaving about 4 to 5 inches after wrapping the last fuse. 4. Repeat from the center outward using the other wire. Create several more strands. I made 4 in total, 2 with larger fuses and 2 with smaller fuses. Twist the strands together. 5. Using 1 of the wires, wrap the ends together on one side. Slide size 8/0 seed beads over all the rest of the wires. 6. Make a loop, wrapping the loose wires to anchor. 7. Cut 2 pieces of beading wire. 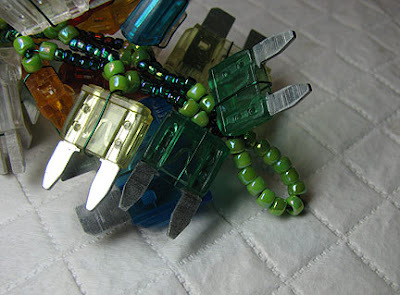 Use a crimp to make a small seed bead loop through one of the loops you created in step 6. 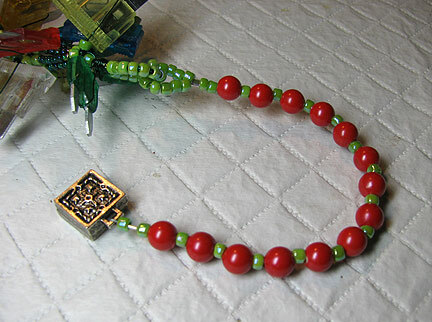 String on beads to finish the strand, crimping it to one half of the clasp. Repeat on the other side of the necklace. That looks so festive, Cyndi. What a clever idea! Brilliant use of an otherwise ordinary object and what a stunning result! I think I'm going to go dig in my husband's toolbox and see what discoveries I can make! Like they say, one persons junk and another persons treasure. Very clever and festive. 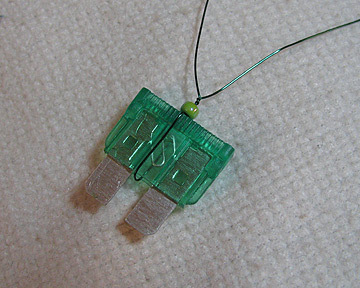 When my husband was in computers I use to make jewelry from the circuit boards. I'll post a link to them soon...gotta find that old post! 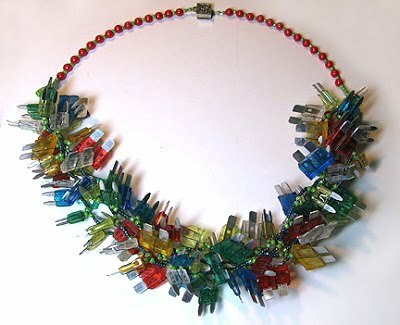 Just goes to show, never throw anything away because you can make something beautiful from it! 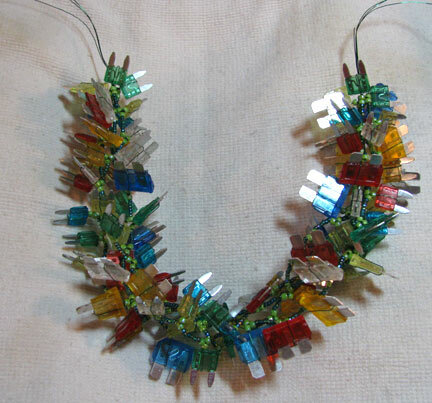 I love how fun this necklace looks.